Above Photo: Teton Range in Grand Teton National Park, Wyoming. BatteryShip is located in Cheyenne, Wyoming USA. Click here for our location information. 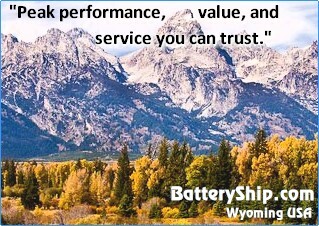 BatteryShip Inc. is an American, family owned and operated company located in Cheyenne, Wyoming, USA. Since 2005, BatteryShip.com has served long lasting, high quality battery replacements and other power products to hundreds of thousands of happy customers online! So go ahead, shop with us today and we'll provide you with the best online experience, pricing and service through our website and 100% USA based staff. BatteryShip uses the highest quality battery cells in the manufacturing of the batteries we offer, including cells made by Samsung, LG, and Sanyo. Higher quality cells result in a longer lasting battery. Be sure to learn more about our Battery Cell Quality, Battery Capacity, and Price Per Ah as they define the value of a battery. In addition to a Factory Direct Price, Same Day Shipping, Secure Ordering, a generous 30 Day Money-Back Guarantee, 1 Year Warranty Protection, and Live Customer Service , BatteryShip products come to us direct and brand new from our manufacturers which saves you money on NEW products. We do NOT sell reconditioned batteries. We do NOT sell used batteries. Our products are guaranteed to work within the specifications of each part (100% OEM compatible to meet and often exceed OEM specs) insuring you complete satisfaction with your purchase. We stand behind every order from BatteryShip. It is the BatteryShip Difference! Outstanding Customer Service: We are good at what we do, and we will support you all the way. We have an ongoing training process that increases the knowledge and skills of our service reps so that your questions will be answered completely and quickly. BatteryShip also offers www.BatteryEducation.com, a site dedicated to helping you understand the technology behind every battery. We also offer a generous return policy and employ rigorous quality assurance procedures. You will be happy with your purchase from BatteryShip! Our customers testify to the fact that we will provide you the help and products to meet your needs. If you have any questions please ask us. Our live personal customer service representatives are available Monday through Friday (excluding holidays), 9am - 4pm (Mountain Time). We also have other convenient ways to reach us. Contact Us Now! The accurate and timely delivery of your order is very important to us and our customers. Afterall, shipping is half our name! Order status tracking begins the moment you submit your order online, and shipment in transit tracking begins as soon as we print your shipping label. Click here to see a map of how fast First Class Mail can get from us to you (shipments under 1 pound travel by First Class Mail unless Priority Mail or UPS is selected). Click here to see a map of how fast Priority Mail can get from us to you (shipments over 1 pound travel by Priority Mail or UPS Ground). Click here to see a map of how fast UPS Ground can get from us to you. Click here to calculate ship cost and time. Click here to learn more about all our shipping options and destinations. Since 2005, BatteryShip.com has served over 500,000 people and we continually reach out to new customers through a growing product line, higher quality batteries, excellence in customer service, and excellence in battery education. Our success is accomplished by the groups that make up BatteryShip; Our Customers, Our Staff, Our Suppliers, Our Shareholders, Our Environment. Our Customers – we believe that our customers deserve fair and honest pricing, excellence in technical support, and a wide battery selection. We offer batteries for over 16,000 electronic devices including laptops, PDAs, twoway radios, barcode scanners, MP3 players, cameras, portable printers, cellphones, and datastorage batteries. In addition to our product lines BatteryShip offers our customers BatteryEducation.com, a blog of articles relating to battery cell manufacturing, battery failures, battery designs, battery technology and battery basics. Our Staff – we believe that BatteryShip has a duty to provide our staff with fair wages and benefits, a clean and safe work environment, and flexible scheduling. Our staff is the heart of BatteryShip and the front line for all of our customers. Our Suppliers – we believe our suppliers are an important part of our business. They are partners in our effort to serve our customers, shareholders and employees. Our suppliers help us deliver exceptional batteries with minimal defects and a very high level of quality assurance that bring to the aftermarket the highest quality batteries. Our Shareholders – we believe we have a duty to our shareholders to provide back to them a reasonable and fair profit. For this, we work relentlessly to make the company operate in the most efficient manner possible. We want to thank you for shopping with BatteryShip and look forward to serving you for all your battery needs!